"A quantum leap forward, a work of such quality that it can serve as the definitive translation for North American readers," - Christian Century. First published in 1990, the NRSV marked the end of 17 years of intensive labor and debate and has now won acceptance across denominational lines. 800 pages, softcover. Hendrickson. 5 1/2" x 8 1/2" x 1 1/4"
Though they are regularly used in both Protestant and Roman Catholic congregations, the books of the Apocrypha are difficult to find in affordable English Bibles today--until now! Readers will enjoy this New Revised Standard Version's contemporary, literal translation and the easy-to-read text. Churches that use the Apocrypha in liturgy and worship will find these editions ideal for education, evangelism, and outreach. 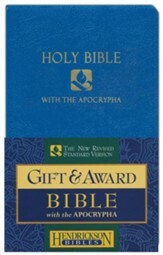 The Apocrypha is a collection of books found in the Septuagint--the Greek version of the Jewish Bible. 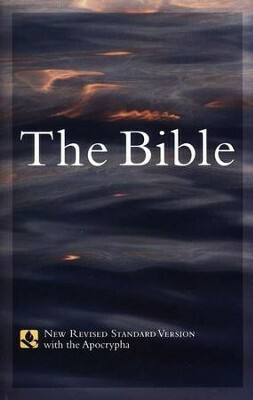 Though not incorporated into the final, canonical version of the Hebrew scriptures, it was included in important Bible translations such as the Latin Vulgate and the original King James Version of 1611. For centuries the books of the Apocrypha have had a significant influence on Christian art, literature, and theology. I'm the author/artist and I want to review The NRSV Bible with the Apocrypha, softcover.